For the past week I have been in a major funk. There are little reasons, life, but truth be told a large part of my funk is due to the big first birthday. 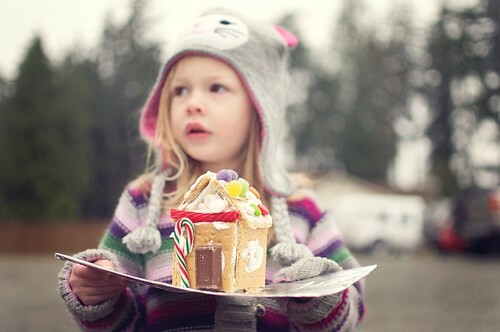 I did not have this with Ava. Maybe it was because I was busy planning a party. Maybe it was because I knew I would have another go around at babyhood. For what ever the reason this is new. I know I do not really want another baby. I know I REALLY do not want to be pregnant again. At least I know I do not want these things in a logical reality. But the lovely thoughts about the day they arrive, falling asleep in your arms, snuggling, baby smell, in short babyhood make me think. Lets just say I have been snuggling just a little bit more, holding her before bed just a little longer, watching her just a little more closely and trying desperately to pause. There have been tears, and smiles and giggles and smiles that create the tears. There are just so many memories to save, so many moments to hold. I just hope I can remember. Ava is not a huggy, cuddly kind of kid. Now at almost four she is more snugly than she ever was as a baby with Larry and I. It is hilarious however, to see her with her friends. They squeeze her with the biggest bear hugs and there is my girl frozen with this tortured look on her face. I suppose someday I should get a picture of that! So when Kristin and Hope headed north for a girls slumber party and Ava squealed “Hope!” and gave her the biggest bear hug ever my heart melted. Despite the distance these girls love each other. Months can go by but it is like no time had passed. There have been many posts like this and there are never words for how much my heart sings that these girls are in our lives. Thank you again for a wonderful weekend our cherished friends! One day in Paris I stopped at a smaller museum that was featuring Monet’s largest paintings. I was totally unaware of the shear size of some of the water lily pieces until I saw them. They never had been my favorite but no denying their beauty! What struck me was the vision behind them. Up close it was just a mess of color, shades, and texture. Until you stepped back and saw the larger image take form. Today it struck me. I feel like a Monet. From far away I appear showered, organized and well, together. But up close I am just a big old mess. That is it. Today I am a Monet. Sometimes you read something that not only speaks to your heart but is as if someone else was actually listening to your heart speak. I know that I regularly post about motherhood its ups, downs and everywhere in between! But I read an article from another blogger this week that must be shared. Here is just one excerpt that really spoke to me but please, please click on the link and read the entire piece. “My point is this. I used to worry that not only was I failing to do a good enough job at parenting, but that I wasn’t enjoying it enough. Double failure. I felt guilty because I wasn’t in parental ecstasy every hour of every day and I wasn’t MAKING THE MOST OF EVERY MOMENT like the mamas in the parenting magazines seemed to be doing. I felt guilty because honestly, I was tired and cranky and ready for the day to be over quite often. And because I knew that one day, I’d wake up and the kids would be gone, and I’d be the old lady in the grocery store with my hand over my heart. Would I be able to say I enjoyed every moment? No. So Carpe Diem what ever minutes of the day you can but know that you are not alone. I now am going to have a dance party with my girls, tell Ava to keep my kisses, nurse Ella off to nap and kiss her peacefully sleeping cheek and for an hour not worry about the thousands of things on my to do list! And later… after I have cleaned the kitchen for the 500th time this week, Ava is having her afternoon no nap meltdown and Ella is pawing at me for more milk I will most likely be counting the minutes to daddy’s arrival and praying for bedtime. Such is the perfectly exhausting job of motherhood. To be behind on just about everything and begin the year long resolution to start this year right and stay on top of things! Here is to more frequent blog posts, a cleaner house and time to breath… is that even possible!? I have not been myself lately… tired, irritable, distractible, frustrated. Right now I am chalking it up to lack of sleep and hormone shifts. Regardless of the cause, my way of battling such feelings is too take on projects. This is clearly a double edged sword as I need the projects to gain a sense of accomplishment, completion and sanity but my day leaves very little time to complete such tasks which then results in additional stress and frustration! The answer…? In addition to editing client pictures my major project has been designing Ava’s big girl room!!! I am obsessed! I started out with one plan that was quickly squashed by the reality of a little B word… budget. I could have easily went to Land of Nod and decorated happily from floor to ceiling but I guess the B word forced me into making the room much more special and creative. In fact now that I am passed the half way point I must say I think I am going to LOVE it! All the furniture is old, refinished or repurposed and all the art work and photos are handmade my me! I did splurge here and there. Here being the BEDDING! 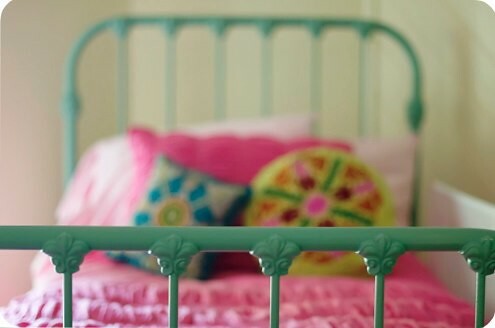 The frame itself is an antique iron bed found on craigslist for a great price. 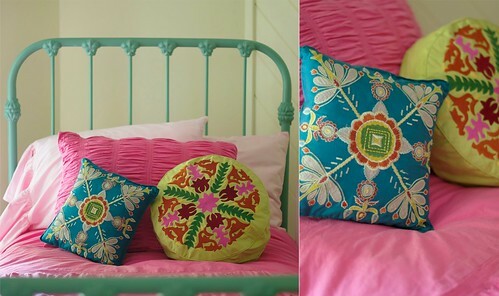 The bedding was handpicked by the little munchkin herself from the Land of Nod catalog. The combination of the two could not be more perfect and is the inspiration behind all the other details entering the space. I call it her princess and the pea bed. So high we need to add rails to both sides, at least for a little while. And the most important thing, Ava LOVES it!!! You she see her smile as she climbs up and snuggles.